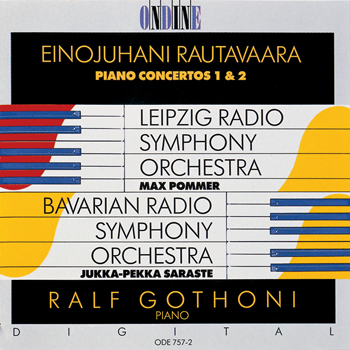 This CD contains the first two piano concertos by Finnish composer Einojuhani Rautavaara, featuring his compatriote, pianist Ralf Gothóni. The recording of Concerto No. 1 was made in Leipzig in 1990, with the Leipzig Radio Symphony Orchestra led by its then Chief Conductor Max Pommer. Concerto No. 2 was recorded in Munich's Herkulessaal in 1989, with the Bavarian Radio Symphony Orchestra led by Finnish conductor Jukka-Pekka Saraste.